Just hours before the Coke Zero 400, NASCAR has announced that AJ Allmendinger has failed a random drug test and has been pulled from the seat of the No. 22 Shell Dodge. Sam Hornish Jr. will be his replacement, and had to fly to Daytona from Charlotte with barely two hours' notice. NASCAR tested Allmendinger during the Kentucky race weekend. According to NASCAR Vice President Steve O'Donnell, Allmendinger's "A" sample tested positive; according to NASCAR, he has the right to request a test of his "B" sample within 72 hours. O'Donnell spoke to the media at 6 p.m. Eastern but took no questions. There was no indication of what substance triggered the failure. Allmendinger has been "temporarily suspended," with no word on how long he will be out. 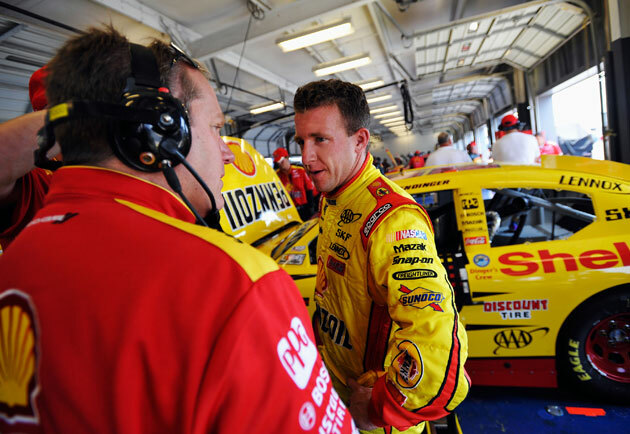 "NASCAR notified Penske Racing this afternoon that AJ Allmendinger was administered a drug test earlier this week, and those results tested positive," Penske said in a statement. "NASCAR has a strict drug testing program that Penske Racing fully supports. Penske Racing will work with NASCAR through this process and its next steps. Sam Hornish Jr., will drive the No. 22 car in tonight's Coke Zero 400." Allmendinger's teammate Brad Keselowski responded almost immediately on Twitter, noting "No comments on 22 car tonight as we focus on tonight's race. Thank u in advance."